Dave, Jim and I did an evening tech dive at Kelvin Grove. I didn't bring my camera along, and I ended up regretting it because we saw some really great stuff. I led the dive, and we came across a stubby squid. I didn't take this picture, but this was a good representation of it. The stubby squid was super cool. We watched it for a few minutes, and then left it alone. 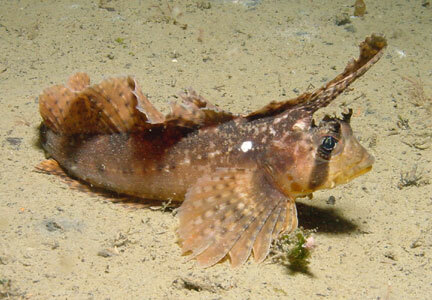 There were a lot of sailfin sculpins as well, which I had not seen that often in the past. At the end of the dive, a salmon surprised us. I had never seen a salmon on a dive before. We were in the shallows and I saw something dart quickly to my right. The salmon swam quickly around us a few times, then vanished. It was very cool!